Apparently this portrait by the late Alice Neel was one of her favorites, in part she said because it was unfinished…. 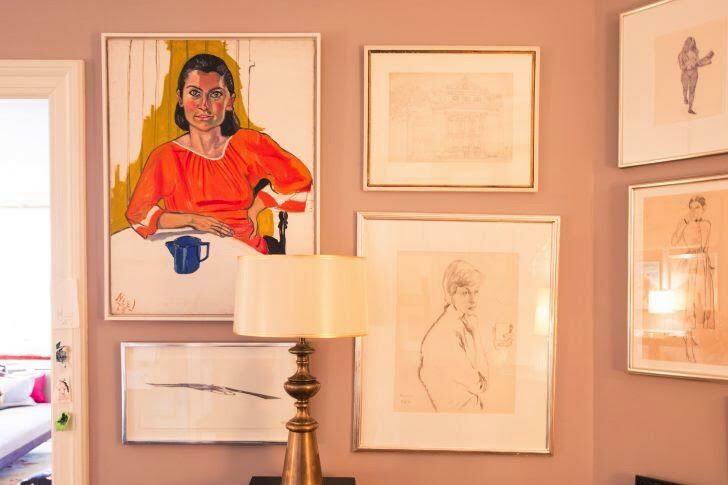 Kate and Andy Spade worked very closely with their friend, interior designer & dealer, Steven Sclaroff. You can visit his shop in NYC at 44 White Street OR stalk his website of online inventory. These are newly framed prints of constellations from the 1920’s, only $325 each. He has total of 25 & they can be purchased individually. Wouldn’t they look incredible all together?? (if you’re interested, you can email the shop directly: info@stevensclaroff.com). It’s not my usual style, but this set of photographs of old Mack trucks really caught my eye. They could add some personality and interest to a more classical or traditional backdrop. Scarloff is known for his great sense of quirkiness and I can see how it would be contagious to be around! We’ll never get to see what creative ventures she would have tackled next, but what an amazing body of creative work she leaves behind in so many ways - from fashion to art, interior design, books, accessories….Quite a legacy indeed.